The Mesa Series Tables and Desks include student single and double work stations, work stations with drawers, teachers station – single or double pedestal, half round tables that are idea to use by a wall or combined with a second half round to provide the option of creating a round table. The Mesa series also includes utility cabinets with or without locking doors, sales desks and teacher desks. High quality manufacturing and aesthetic design makes the Mesa series idea for the classroom, training room, hospitality training rooms, library or business meeting room. Contact Bakagain for QUANTITY DISCOUNTS! 47.25″w x 29.5″d x 29″h Weight: 144 lbs. 59.25″w x 27.75″d x 29″h Weight: 195 lbs. More in the Mesa series. 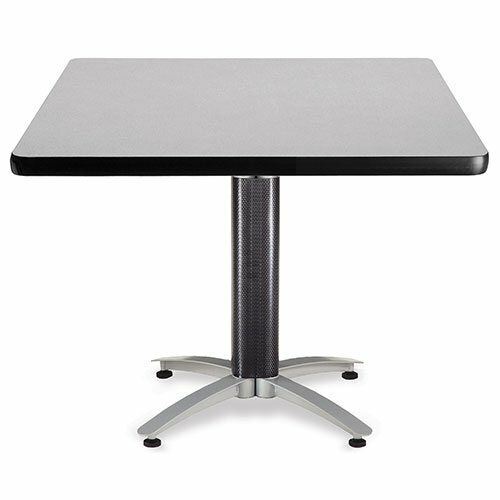 Mesa Series Training Tables are perfect for Classroom, Training Rooms, Computer Labs & your Library. The innovative wheel barrow design (leveling glides front/casters rear) allows you to quickly rearrange from independent study to collaborative arrangements. Drawers are large enough to store your tablet computer & other mobile devices. This multi-functional design will save you money! The table top contoured surface on the back edge allows you to face stations towards one another & route cables neatly between desks. Choose from 3 table widths and 3 finish options. 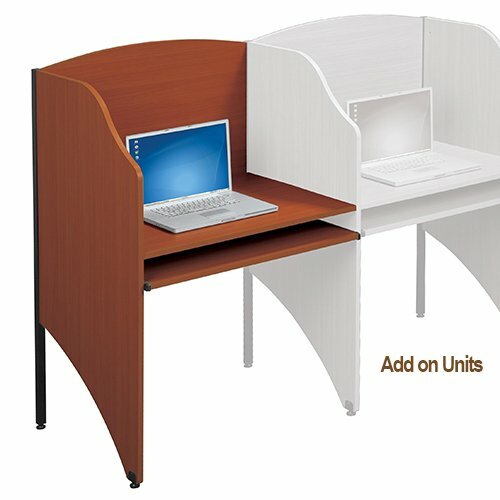 Our Standard Study Carrels provide ample room for study, test taking and research with a roomy desk top and pull out shelf for a laptop, tablet or keyboard. The Study Carrels work will in testing facilities, sales offices, classroom, public spaces and of course the library. Start with a Standard Floor Carrel to start a row, and then join as many Add-A-Carrels as you need to complete the desired number of study spaces in each row. The contoured side panels create pleasing arrangements while providing need privacy between workers or students. The Retractable shelf is ideal for a keyboard, laptop, tablet computer or study materials. Optional Pop-Up Grommet Outlet & USB Charger available. Set up your classroom fast – Ships Assembled – just bolt on the legs and you science lab is ready!